As part of the 2015 POPSUGAR Insights Food study, we surveyed female visitors to POPSUGAR Food to better understand their grocery-shopping behaviors. 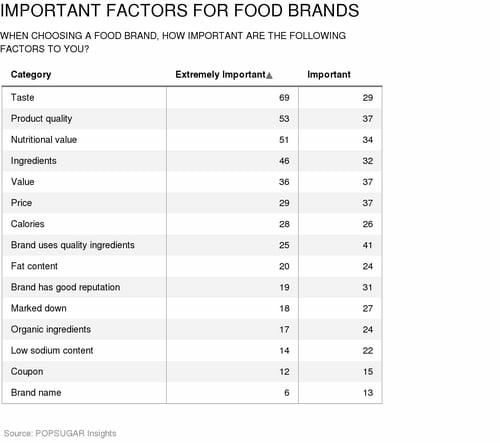 One of the areas we were most curious about was what characteristics drive purchasing decisions for food brands. By ranking the responses that women selected as "extremely important" and "important," we can see that "taste" takes the cake, with 69% of women ranking it as extremely important and 29% of women saying that it is important. Product quality ranked second overall with 53% of women finding it extremely important. Nutritional value was cited as extremely important by just over half of women we surveyed, followed by the individual ingredients. When it comes to influencing future food-purchasing decisions, quality and taste still reign supreme. About 8 in 10 women said that being a "quality product" is the key factor that leads them to consistently purchase certain food brands. Exactly 80% of women said that taste is what matters most. Having a good price (70%) ranked third overall.